Harsh Teutonic sounds pouring out of my earphones, reaching us from the rainy, water-logged flats of Hamburg in good old Northern Germany. And you will find a few more soundbits of the same ilk on this disc. 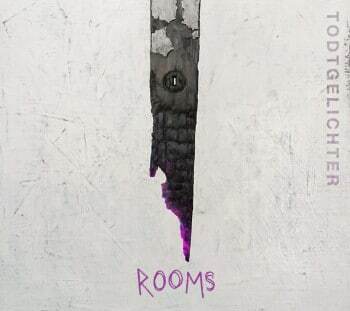 Rooms is like the possessed evil twin of the usually somewhat genteel Progressive Metal genre talking to you. The one that has gone down the Black Metal road, and then got second thoughts. And it is not easy fare, pretty hard on your system and eardrums too. Like a Progressive mixture of a darker Myrkur and their album M with Lithourgyia from Batushka. Yet they are no Black Metal act – anymore. An evil version of Zierler, if you will. And sometimes – just sometimes – the record feels like the forgotten sibling of the latest disturbing concoction Dodecahedron unleashed in 2017. Todtgelichter and their 5th studio album Rooms will however command your attention as of the first note. Two souls – good and evil – inhabit the album, too. And this leads to this sublime chaotic dissonance on this album that is very alluring at times. As to the label, let’s hope that this new alliance and the more aggressive style will allow them to market themselves better. ‘Cause they got promise, but they need to move beyond their German boundaries, out of the underground and into the world. Of course, their style will find them a limited, albeit a still sizable audience. There are big bands out there in the Progressive arena doing quite well for themselves. Leprous would be one for instance and in my book Todtgelichter should be able to at least get to the same level. You might have guessed it in the meantime. Rooms is not your usual metal record, trying to beat you to a pulp through endless thumping. And I really do like spice. Especially, if a band delivers somewhat of an indefinite style, unwilling to be pinned down. This record definitely meets that kind of criterion, and is for sure wildly veering about this Progressive Alternative landscape of gray desolate rocks. Then going off into some sort of a dissonant state, one of the hallmarks of some Black Metal concoctions – moins the growls. There are some screams, though, kind of strategically placed throughout the record. Todtgelichter saw first action back in 2002, mainly as a Black Metal act, but then morphed into Progressive and Avantgarde Metal later (well…). And now they are back to what? Some sort of blackened Prog Metal or progressive Black Metal of the avant kind. Well, whatever! This is such a wild mix, it is a little of everything. Alternating tracks in German and English is another quirk of an already quirky roll of magical spells. The band went to great pains to create an ever-changing atmosphere. Sometimes church-like, then again out in the boonies somewhere. Todtgelichter really garnered some attention with Angst, their 3rd full length back in 2010. The record did not impress me too much. Quite apart from some of the reviews and reactions I was able to read. But then, Apnoe followed in 2013 – quite mature and with no metal anymore, going experimental post-rock almost. No doubt they lost some fans over this. Now this culminates in Rooms, one of their darkest productions so far. For this album, the lineup saw some changes too: Marta Braun now covers vocals, and Frieder was added for keyboards. Tentakel Parkinson on drums and Floris on guitars, plus Frederic for more guitars and backing vocals are known values. And these are good changes, as the quality of the album can easily attest. In relation to their former albums, Rooms is generally much more mature in its delivery. And the first track Ghost will step right in – or more accurately – will step right on you. A no-nonsense style track that made me listen longer than I should have, when selecting albums for the review pipeline. Then they remember that German is their mother tongue and slip Schrein into the album. Very well done. But then this production gets disturbingly close to bedlam with every new track. Down, down these slippery stairs it goes to the cold concrete room of horrors, hitting you with Zuflucht towards the half of the second half. All of that presented in a very complex and raw display of dissonant tunes and melodies, gripping at your brain with screams arriving from nowhere. Then again interspersed with organ interludes, just to shock you into wakefulness again by mighty drum work – just check out 4JK. Now, also towards the 2nd half of the album some holes appear in this mighty steam boiler of theirs. Tracks that do not seem to belong become apparent, Necromant being one of them. Then the two last tracks Origin and Pacific are surprisingly weak compared to the beginning of the album. And this is a pity, because it spoils some of the fun. On the mixing and mastering side, however, they hit things spot on. If you like a tune that will suddenly change out of nowhere, keep you unhinged for 52 minutes of total madness and you still emerge unscathed, then Rooms is for you. Rooms is for sure not a record for a relaxing evening in your rocking chair on your porch. It will keep you on your toes and demand your attention for every friggin’ minute you spend with it. Todtgelichter present high quality musicianship on Rooms with a progressive twist, sometimes blackened with tales from the Black Metal universe, whilst not quite qualifying for it. After all, the latter is where they found roots in the beginning. But they have moved far, far down different roads for now. For sure, the album is never boring and presented in two languages to boot. Now, if you were looking for your usual predictable song structure with catchy refrains, then this is definitely not for you. All the others, why not give it a shot. I thoroughly enjoyed listening to the album. The album – not surprisingly – obtained an honorable mention on the 2016 Top 10 Records. Good stuff. In addition, this record successfully made it onto the Intermittent Digest – Tome III. This entry was posted in Reviews, Todtgelichter and tagged 2016, 7/10, Alternative Metal, Avant-Garde Metal, Batushka, Black Metal, Death Metal, Leprous, Marta Braun, Myrkur, Post-Punk, Review, Rooms, Supreme Chaos Records, Tentakel Parkinson, Todtgelichter by RockmusicRaider. Bookmark the permalink.